We had a great time in Ann Arbor, MI recently with Thirdware at it’s annual Family Day gathering where adding a Build-A-Bike team building program really took the energy level up! Starting as a small technology support firm in Mumbai in 1995, Thirdware has grown to over 1,000 employees and has earned many awards in their field. They have had offices in Michigan since 2004, and have been hosting this annual Family Day as a way to bring people together ever since. Adding Build-A-Bike to their agenda this year gave everyone an opportunity to interact and enjoy the morning together in a whole new way. 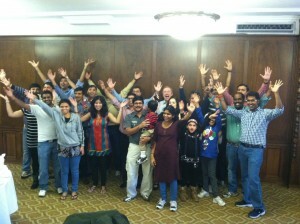 The majority of the participants were raised in India and have spent their careers working with technology. They jumped right into the activities with a competitive spirit and energy. Husbands and wives competed against each other with friendly banter, and co-workers got into the spirit and joined right in as well. With so many families in the company coming over from India quite recently, they decided to donate the four bikes they built at the event internally. 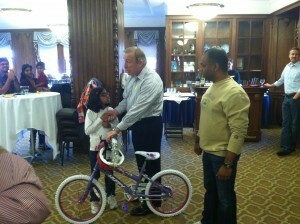 The four kids who helped build the bikes during the event got to ride them around as the happy recipients at the end. The universal feedback we got at the end of the event was how much the participants were able to learn about each other from interacting in a completely different way than they normally do in the workplace. With every observation and lesson pointed out by the participants, they were able to tie them back to similar challenges they sometimes face in their working environment. So if you’re looking to bring more energy and fun to your next corporate gathering in the metro Detroit, Michigan area or any other major city, include the Build-A-Bike Team Activity in your agenda and create a memorable experience for everyone!